Eight Hundred Grapes - . "You have to grow, mold, squish about eight hundred grapes to get just one bottle of wine. If that isn't an argument to finish the bottle, I don't know what is." Once in awhile, the perfect book at the perfect moment comes along and it's a beautiful thing. 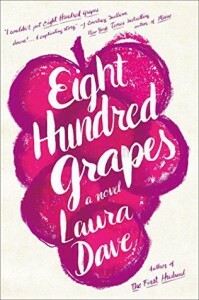 When I saw that Laura Dave had a new book releasing soon, and that it was available on Netgalley, and that it was ABOUT WINE, I jumped at the chance to read it. Her previous novel, [b:The First Husband|9977379|The First Husband|Laura Dave|https://d.gr-assets.com/books/1332107580s/9977379.jpg|14871824], is one of my favorite books, so my expectations were high on this one. I'm thrilled to say that I loved every single minute of this book. Dave's writing is beautiful and once I started reading, I didn't want the book to end. Right before her wedding is to take place, Georgia finds out her future husband is keeping a big secret from her. In order to get her mind straight, she goes back home, to her family's vineyard, only to find her normally stable family is falling apart and going through their own problems. More secrets start to unravel, and Georgia, who is normally the 'fixer' of the family, is finding out that she can't control any of it, no matter how hard she tries. "You don't give up on a family. Not without trying to put it back together." 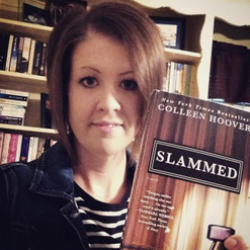 I loved the family dynamics and watching all of the stories unfold between her parents and her brothers. I found that her family was really interesting and likable, and I was hoping for a good outcome for everyone in the end. I even loved the flashbacks to the earlier days of her parents courtship, and how the vineyard came to be. Mostly, it was my investment in Georgia and the decision she had to make in the end that had me anxiously flying through the pages. And because I love wine, I really enjoyed learning the ins and outs of how a vineyard/winery is run. It was fascinating to me, and added so much more to the story that made it even more enjoyable. Not to mention, their signature wine is a Pinot Noir, and that is my absolute favorite. Yeah, I was definitely hooked from that moment on. I found myself highlighting a lot of passages in this book, which I don't do very often. Most of them are just common sense reminders, but I love seeing them built into a story I adore. "Most of the time a person wants something more than anything else. You can tell because at the end of the day that's what they're willing to fight for." "You should be careful not to take the person you love for granted." "You couldn't always work so hard to fix it. Even if things didn't always go the way they should, sometimes they went exactly where they needed to." Realistic with the perfect amount of family drama and a touch of romance that makes for a great summer read!